The Heartland Carwash Association (HCA) is a regional non-profit trade association representing nine states in the Heartland of the United States of America. Iowa, Minnesota, Wisconsin, Nebraska, Illinois, Missouri, Kansas, North Dakota and South Dakota carwash owners, operators and service provider associates from many states make up the core membership of HCA. The HCA’s mission is to strengthen the professionalism of the carwash industry through the dissemination of information, idea exchanges and networking, lobbying and access to the latest in equipment and supplies. The association is managed by a professional team of experts specializing in legislative and regulatory representation and association management. HCA is governed by a voluntary board of directors elected from the membership who set policy and guidelines for the association’s activities and services. Discount and special order items from Grainger. Subscription to Splash, our quarterly newsletter. 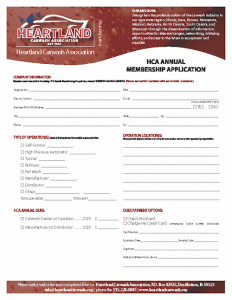 HCA membership stickers to display at your carwash. Ability to become a Watersavers member though the HCA’s alliance membership. Affordable credit and debit processing through First Financial. Discount on employee background checks through GoodHire.com. Illinois members can obtain discount tickets to Six Flags Great America, located in Gurnee. Kansas members can obtain discount tickets to the Schlitterbahn Waterpark, located in Kansas City. Minnesota members can obtain discount tickets to Nickelodeon Universe, located inside the Mall of America. Missouri members can obtain discount tickets to Six Flags, St. Louis. Nebraska members can obtain discount tickets to Fun-Plex Waterpark & Rides, located in Omaha. 15% discount at ProFlowers, Personal Creations, Shari’s Berries, and Gifts.com.